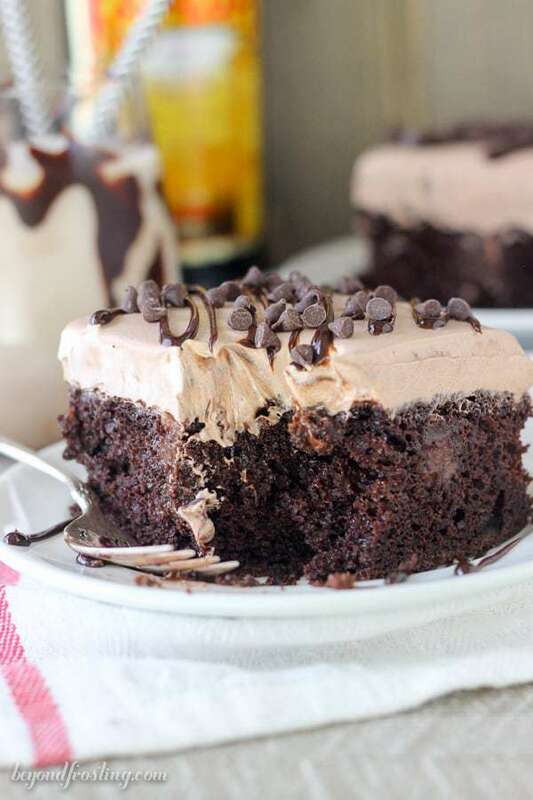 This Mudslide Poke Cake is a dark chocolate cake soaked in a spiked chocolate ganache, Kahlua chocolate pudding and a spiked chocolate mousse on top. There’s plenty of chocolate and booze to go around. I am not going to judge you if you would prefer to keep this cake all to yourself. I feel like we know each other well enough by now that I don’t have to tell you how much I enjoy a boozy dessert. Seriously, if you put bourbon it in, I will probably try it. It’s just my thing. This time I am bringing a little booziness to the poke cake. I have become quite fond of the poke cakes. They are just so easy to make, and lets face it, they taste amazing. Whenever I serve a poke cake, no one know what to expect with the cold cake and the pudding keeps the cake especially soft. It’s a great way to combine different flavors and textures. 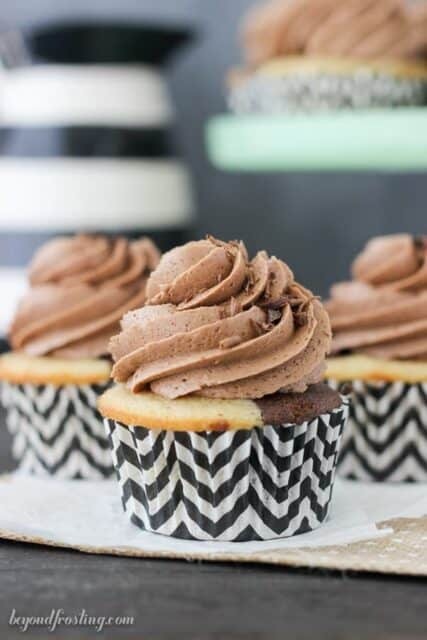 They are my go-to desserts for parties and potlucks. 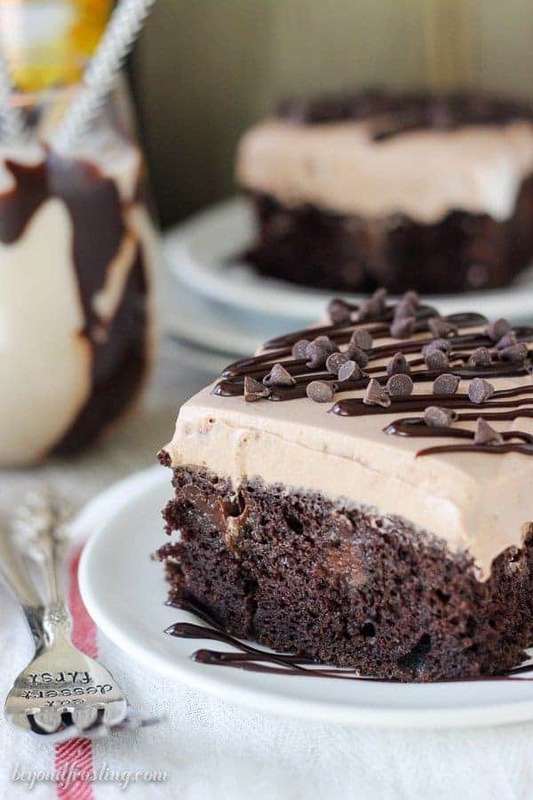 I decided since I like you guys so much that I WILL share this Mudslide Poke Cake with you. It starts with a rich chocolate cake and then it’s soaked in a spiked chocolate ganache and a boozy pudding. To finish it off, it’s topped with an alcohol infused mousse and more chocolate (as if there wasn’t enough already). For the Mudslide Poke Cake, I baked and regular boxed chocolate cake mix, but I replaced the water with a strong brewed coffee. 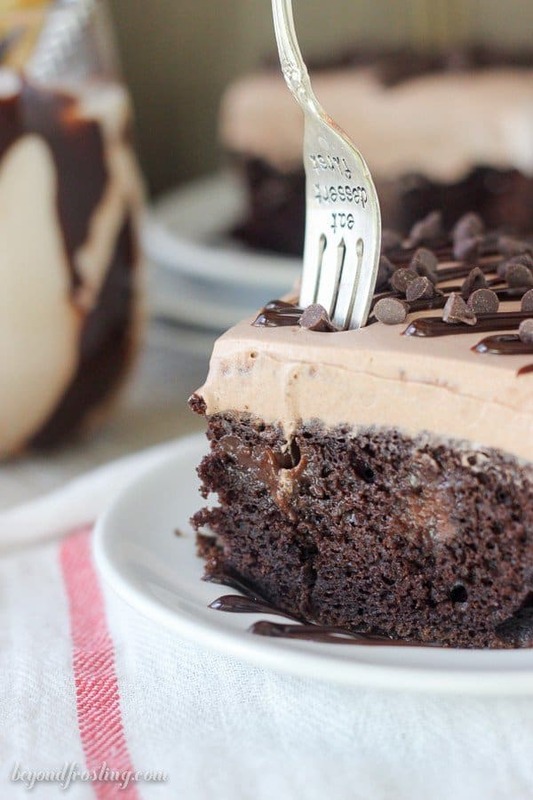 Replacing the water for coffee does nothing but add awesomeness to your cake. They say that the coffee actually enhances the chocolate flavor. 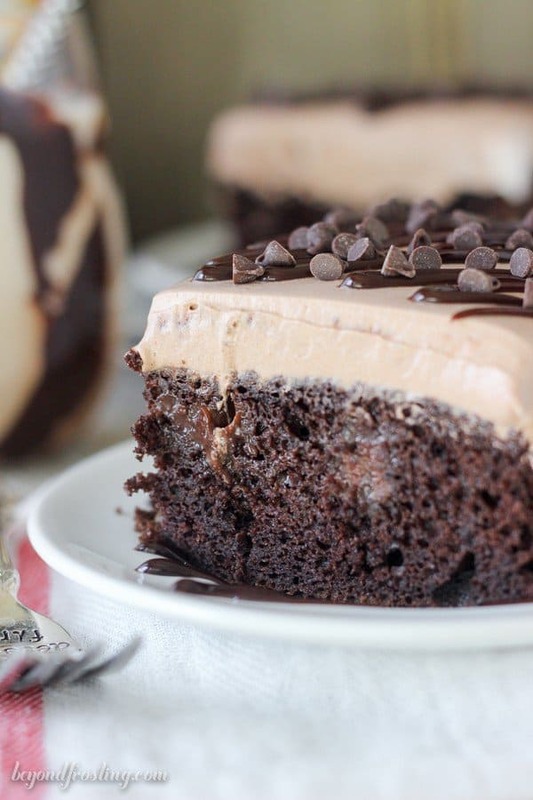 You can’t taste the coffee in the cake, so don’t be afraid of this substitution! This cake uses both Bailey’s Irish Cream and also Kahlua. If you don’t have both on hand, you could technically use one or the other. The Bailey’s is used in the chocolate ganache and the Kahlua is used for the boozy pudding filling. For the mousse, I’ve given you the option to use either of the liquors, or better yet, you can use a little bit of each one! Hint hint. You will notice that the mousse stays a little bit softer, don’t worry, you didn’t do anything wrong. It just happens when you use the alcohol in the pudding. 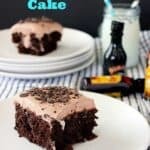 If you’re looking for an alcohol free poke cake, don’t worry, there are plenty of those too. 2 tablespoon Bailey’s Irish liquor. Bake the cake according to the instruction on the box. Allow to cool for 20 minutes. Take the end of a wooden spoon or another round object and poke holes all over the top of your cake. While your cake is cooling, prepare your ganache. In a heat proof bowl, combine the chocolate chips and heavy cream. Microwave in 30 second increments, stirring occasionally until the chocolate is melted. Whisk in 2 tablespoon of Bailey’s Irish Cream. 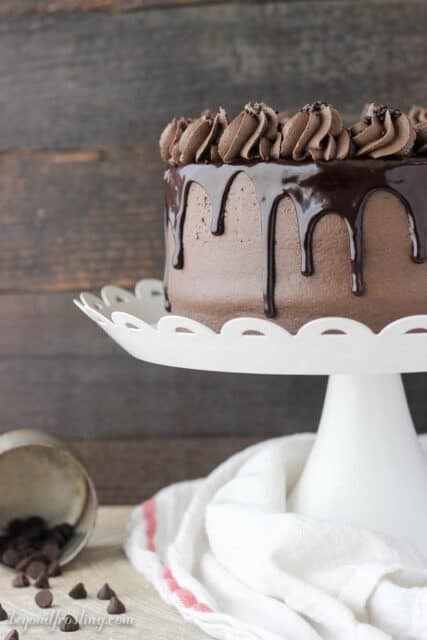 Drizzle the ganache over top of the cake. In a separate bowl, combine the instant chocolate pudding, milk and Kahlua together. Whisk until the powder is dissolved. Before the pudding sets, while it is still pourable, pour the pudding over top of the cake and spread with a spatula if necessary. For the mousse: In a medium-sized bowl, combine the chocolate pudding mix with the milk and liquor of choice. Whisk together until combined. Place the pudding in the fridge until it is completely set, 10-15 minutes. Once the pudding is set, fold in the Cool Whip and stir until well combined. Spread the mousse over the cooled cake and return the refrigerator for at least one house, the longer the better. can this recipe be frozen? I was going to make it in two round tins, and freeze them when completed. 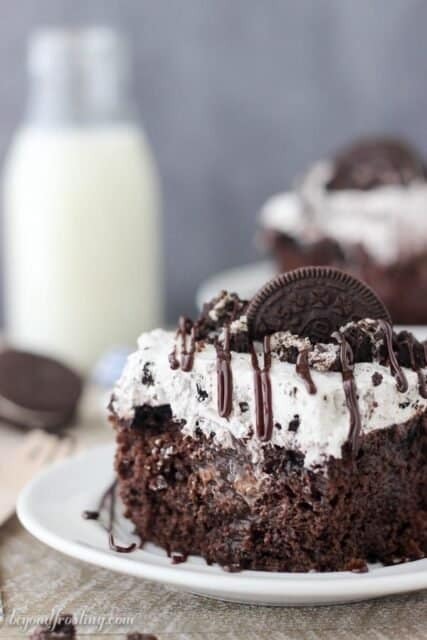 I definetly have to make this cake! Looks Delish-Thanks! Can you use home made whipped cream instead of cool whip? I would like to make this cake then cut into a horse shape while on the serving platter (single layer). Will it hold up or crack up due to pokes? Hi Ann, I would not recommend cutting this into a horse shape in fear that it would fall apart.